The VP Series is a favorite for civilian sport shooters, security, military, and law enforcement. Its high quality metalwork has been finished with a protective coating to ensure years of high performance and no corrosion or wear. This subcompact model is perfect for concealed carry. Get yours today! The little sister to my VP9! Liked the new color look. That makes 4 H&K's for me. Quality of product. I have owned two other Hk's. I have a HK VP9 which I really like, so when I decided to buy a sub compact gun, HK was one of the first that I looked at, and Grabagun happened to have a great price on this VP9 SK. I love HK quality, and I priced it everywhere and Grabagun had the best offer. SOLD! I already own one of these and love it so much I wanted to double-down. Price was great. Th quality of the pistol , great trigger , and small grip will make this pistol useful to me and my wife. I needed an off duty pistol with more ammo capacity in todays world . 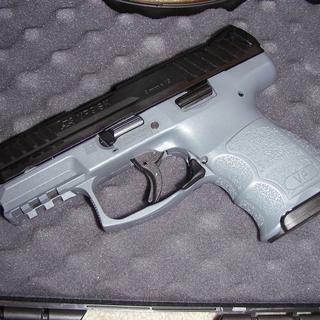 It was a good price, I didn't necessarily like the gray but it was a good price for this gun. I am hoping to use it for my new carry. This is my 1st H&K pistol and I really enjoy it. It has a great feel to it. It shipped really quickly to my home in NY, I will be purchasing from GrabaGun in the future. Purchase experience very professional, prompt, and very hassle free. I love this weapon, its small, but feels great in my hand, especially with the pinky extender magazine. It is a very well made firearm, and extremely accurate right out of the box. Love the feel of this gun. One of my favorites! My third HK but my first HK Sub Compact. Shot it for the first time on Friday 1/25. Seven yards and ten yards. Fired 100 rounds with no problems and no issues. Very accurate for a sub! Wow! Another satisfying experience with Grab a Gun !! Got a great deal on this pistol.. 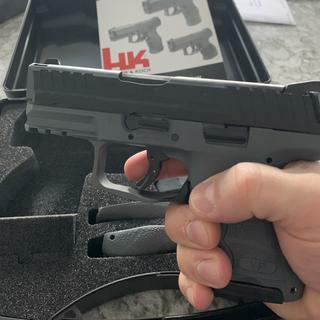 I've been wanting a grey framed gun and an HK for a while..saw the price on this and it was a no brainer.. I had to have it ! 500 rounds through it and it's perfect ! No malfunctions and very accurate..as always with Grab a Gun, fast delivery ! I have a VP9 and wanted something smaller for conceal and carry so I bought the VP9sk. I love the quality of the gun, the way it feels, the way it fires. My son had never even fired a gun before. He fired to VP9sk and was able to hit the target very well. I'm very satisfied with this gun, and the folks at GrabAGun. I would recommend it for anyone. Fantastic EDC Gun! I could not be more pleased. If you've never shot an H&K, you owe it to yourself to do so. Specifically, the VP series of weapons are outstanding choices. I've trained a ton with my VP9, and am thrilled that H&K brought the VP9SK to the market. The ergonomics of this grip, the shootability, and the trigger make this my choice for everyday carry. This is my second (or third) purchase from Grab-A-Gun. Their prices, staff, and overall service is fantastic. I highly recommend! Outstanding concealed carry gun, but make sure to pick up some 13 round factory HK magazines to really complete the package. 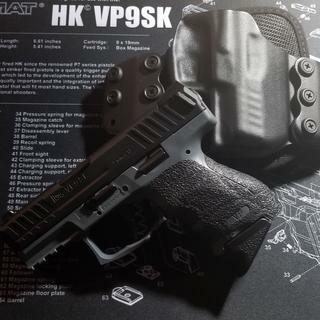 The first striker-fired HK pistol since the P7 series in the 1980s, the VP Series is an incredible double action handgun for civilian sport shooting, security, military, and law enforcment use. It utilizes a striker firing system with an enhanced, HK "light pull" trigger. The cold hammer-forged barrel is made from cannon grade steel, a quality and durability ensuring a long service life, and the polygonal bore profile provides an increase in muzzle velocity. Both the slide release and the paddle-style magazine release are ambidextrous. The machined steel slide is coated in HK's hostile environment finish to protect it from corrosion and wear. All of the metal components, including the springs and pins, have superior metallurgy. These VP SK subcompact models feature a more concealable design with a shorter barrel, abbreviated Picatinny MIL-STD-1913 rail, and a compact grip frame that still sports the VP grip feature of interchangable backstraps and lateral grip panels. This particular model has a grey frame and black slide. It comes with 3-Dot sights and includes two 10 round magazines, one flate base and one extended floorplate.